Some recycling tips from Retro Housewife. Since everyone seemed to enjoy the recycling tips in my last post I decided to share some more. 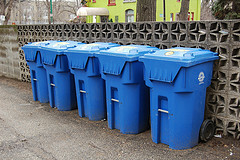 Of course remember recycle is the last of the three R's, first reduce and reuse. When those aren't an option here are a few others to help you out. Home Depot will recycle CFL's. CFL's have mercury and should never go in the trash.You can also get a kit to mail them in to Waste Management. Origins started recycling cosmetic jars, bottles and tubes a couple of years ago. They will recycle any brand, so start saving all of your cosmetic containers today. Gazelle has a great e-waste recycling program. They will pay you for your e-waste and if the item can be fixed they wipe all personal data off and sell it. 80% of the items get reused! What is recycled is done in the US. You can also take e-waste to Best Buy. Earthworks takes PVC like hotel keys, credit cards, etc... You can contact them for info on mailing your items to them. Whole Foods will recycle #5 plastic. The wonderful Beth Terry from My Plastic-free Life is largely to thank for the fact that Whole Foods will recycle used Brita filters. Wal-Mart, Staples, Target and most grocery stores will take bag plastic bags. This includes bread bags and sandwich bags (remove any zippers or ziplocks first). All of these items can be taken to Best Buy. Former boother EnviroRambo talked about how you can recycle these. Read about it here. EnviroRambo helped us out here as well. Read about it here. Another former boother the Greenhabilitator told us about recycling glue sticks, click here for more. And yet another post on the Booth about recycling! JessTrev shared how to recycle your old baby gear, click here for more. Best Buy and Staples will recycle inkjet cartridges. Check out TerraCycle to find out about setting up recycling to raise money for your group or school. If you have more ways we can recycle be sure to share. Great tips Lisa! I didn't know about a lot of those! Great way to see some good tips all in one spot! I'm glad we have an Aveda teaching school in my town so I have some place close to drop off bottle caps. Love these reminders! Our Whole Foods will also recycle old cell phones. I saw at Target that they have a bin to recycle MP3 players but I haven't really looked into it. Great post! I didn't know that Origins recycles all cosmetics. All Green Electronics Recycling is another great resource for recycling, especially if you're in California. They have a lot of drop-off points and recycle most electronics for free. Also you can call All Electronics Recycling in L.A. at (800) 924-0884 and they'll send a driver to your door for a free e waste pick-up. It's really easy. Will You Answer My Gardening Questions? Are There Fake Blueberries in Your Cereal? Just How Many Milk Decisions Must I Agonize Over? Who Can Be an Activist?